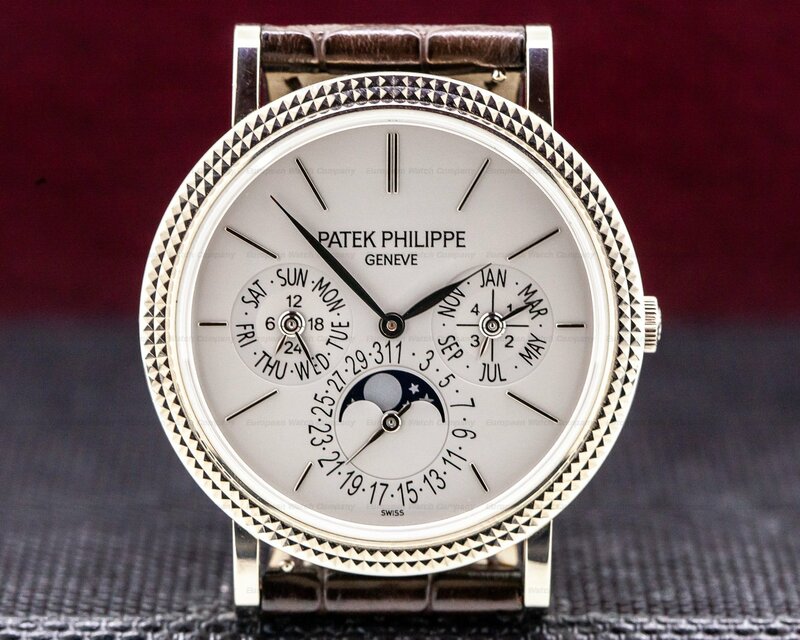 30110 Patek Philippe 5136 Perpetual Calendar 5136G, 18k white gold on an 18k white gold bracelet, automatic Patek caliber 240 movement, opaline-white dial with hour markers, month, day, date, am/pm indicator, moon phase, leap year indicator, diameter: 37mm, thickness: 10.5mm, sapphire crystal, display back, water resistant. 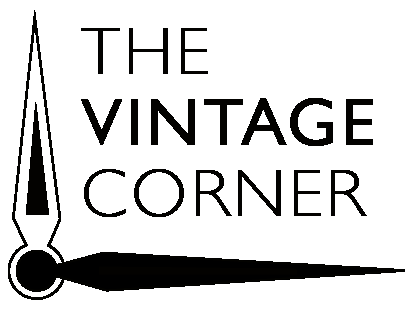 Like New with box, setting stylus, extra solid caseback, a photocopy of the original certificate and extract from the Patek Philippe archives. 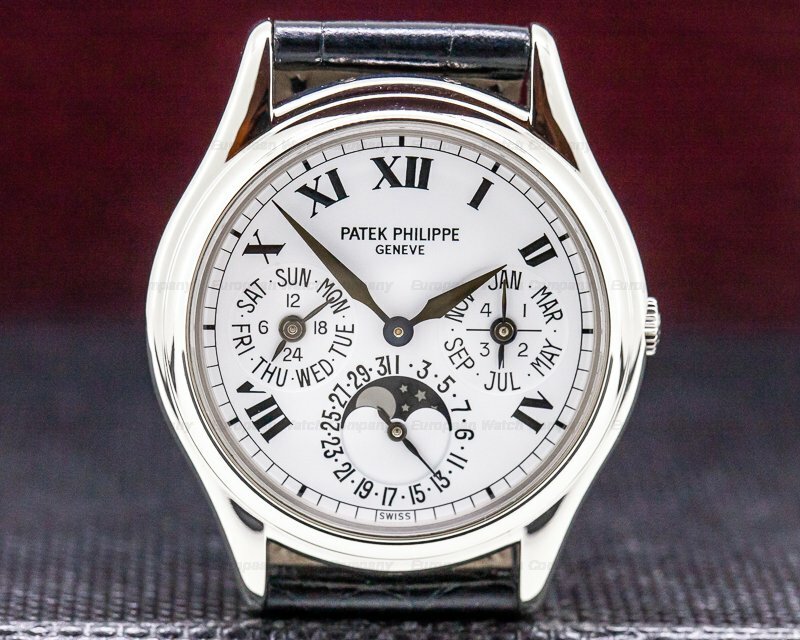 This is an 18k white gold Patek Philippe Perpetual Calendar 5136/1G-001. It has an integral 18k white gold link bracelet with a triple folding deployment clasp, and a scratch resistant sapphire crystal. 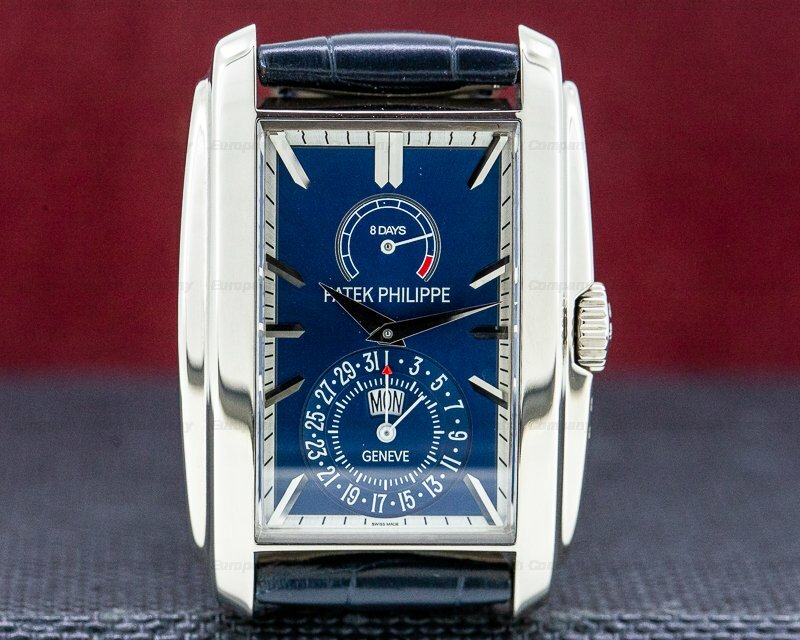 It has a pull out winding crown, and a corrector on the left-side case band at 9 o'clock for the perpetual calendar. 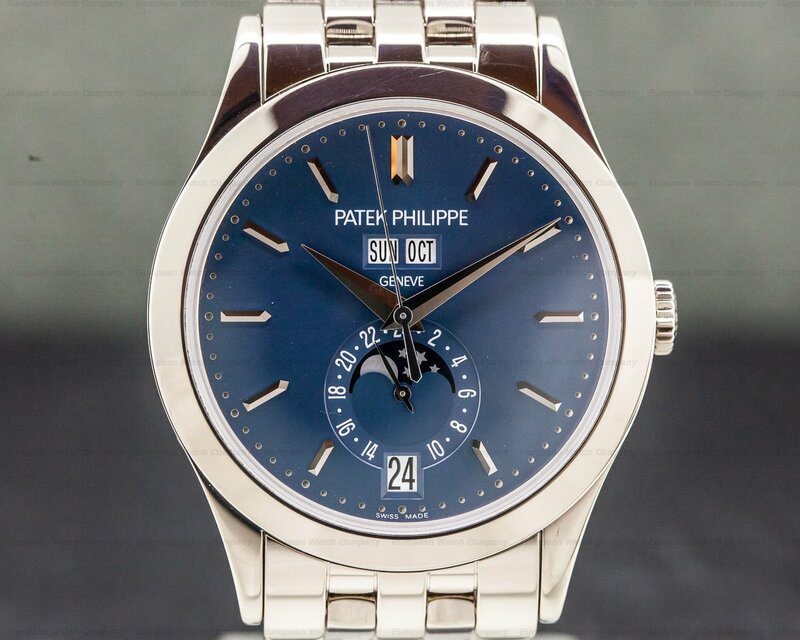 There is a screw down exhibition sapphire display case back, and the 37mm diameter solid three-body case, gently curved lugs each with a hallmark underneath, bracelet, and rounded stepped bezel, are polished. 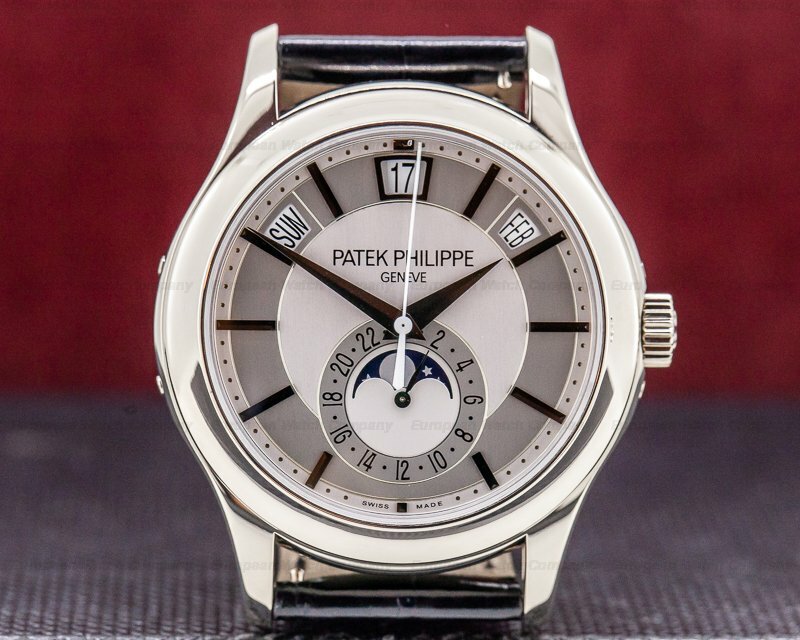 It has an opaline white dial with applied boat-shaped baton hour markers around a dot minute scale, and white gold dauphine hands. 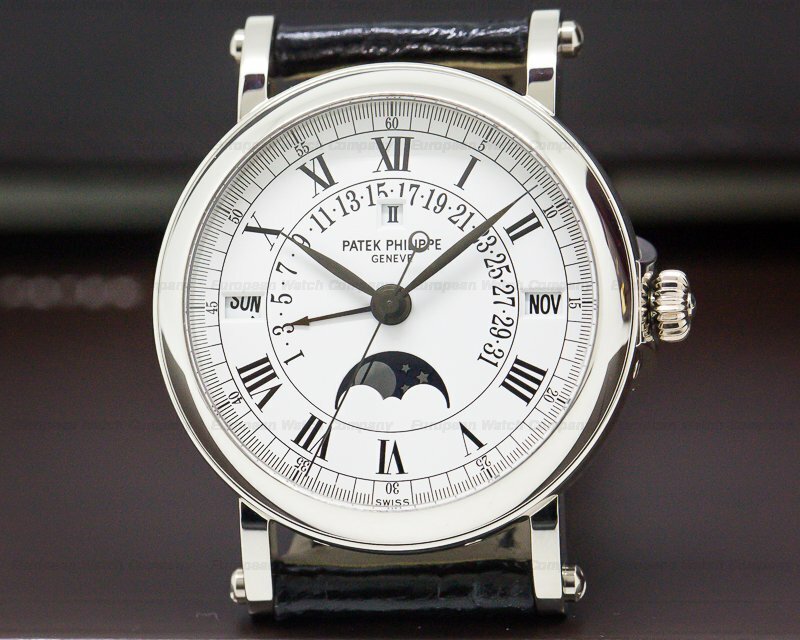 There are three recessed white subsidiary dials with black Arabic numerals and words, and white gold indicator hands, including a combination day/24-hour dial at 9 o'clock, an am/pm indicator/moon phase/radial date register at 6 o'clock, and a combination month/leap year dial is at 3 o'clock. 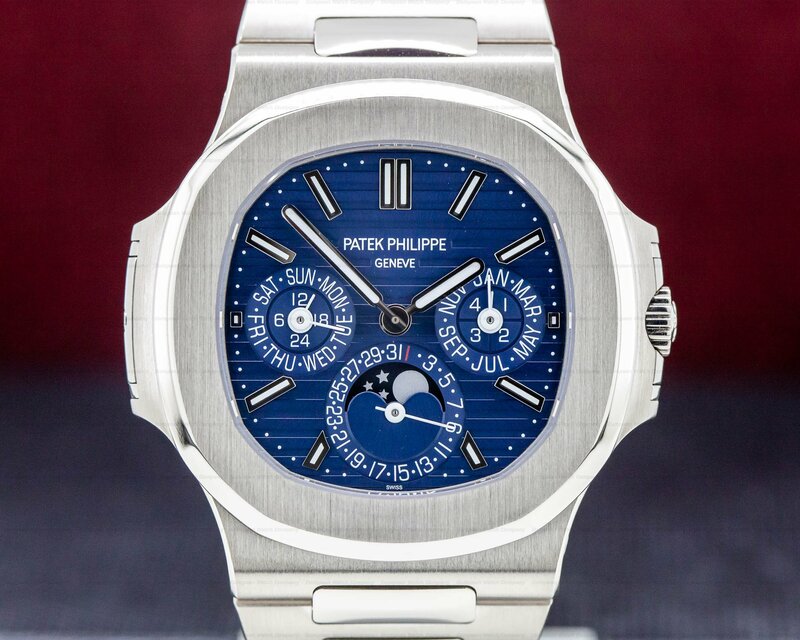 It's water resistant to 25 meters/80 feet, and it has a 48-hour power reserve at full wind. The 10.5mm thick case, dial, and movement are all signed. 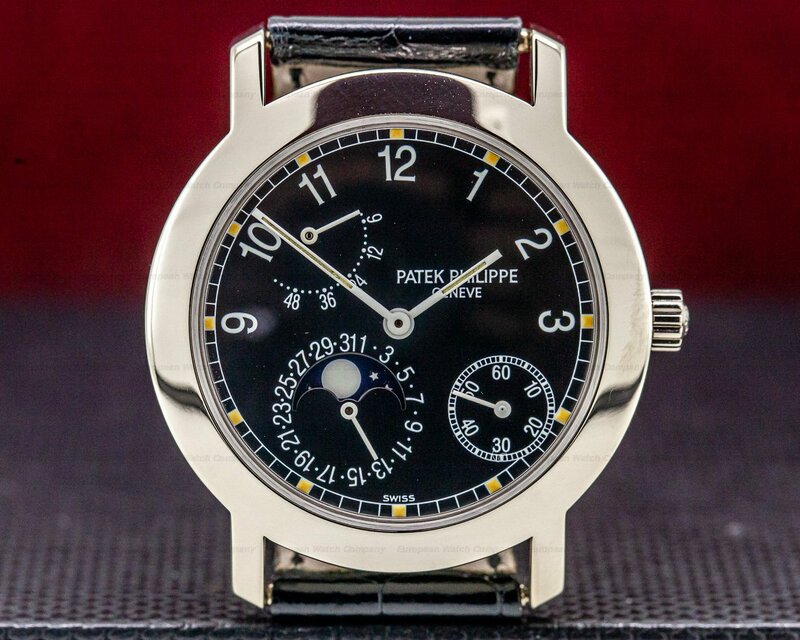 This Patek Philippe Perpetual Calendar 5136/1G-001 has a mechanical automatic self-winding Patek Philippe caliber 240/114 movement. 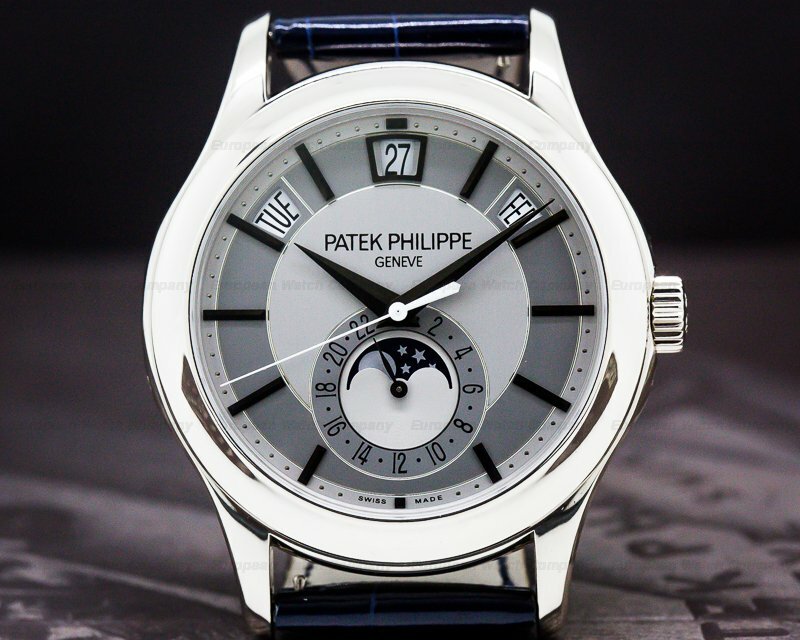 It's rhodium plated with cotes de Geneve embellishment, and it's hallmarked with the Patek Philippe seal. It's constructed with 27 jewels, 275 components, 8 bridges, and a shock absorber device. It includes a monometallic Gyromax® balance that's adjusted to temperature and 5 positions, a Spiromax® self-compensating balance spring, an index regulator, and a 22k gold off-center micro-rotor. The mechanism oscillates at a frequency of 21,600 vph (3Hz). 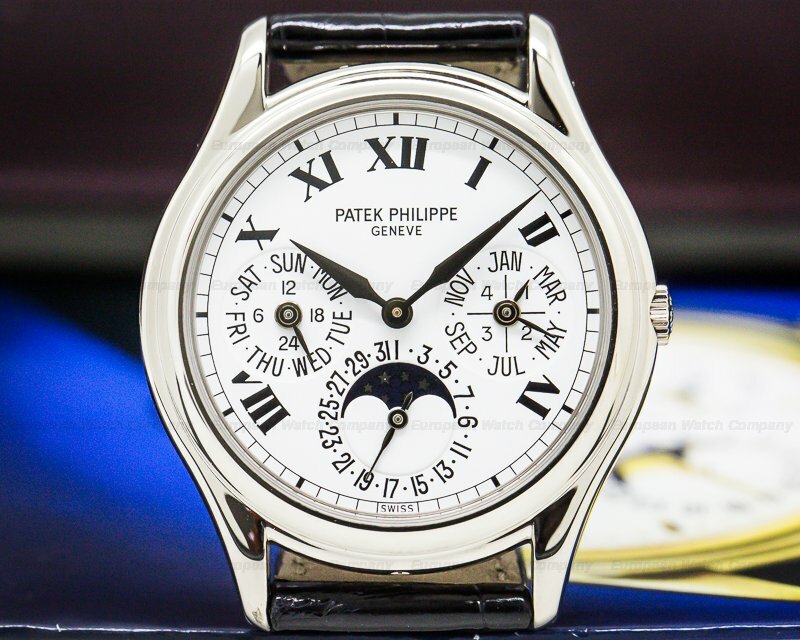 The Patek Philippe Perpetual Calendar 5136/1G-001 was introduced in 2004.